Deeply rooted in the spiritual tradition of Zen Buddhism, Islamic Sufism, and Christian mysticism, video works of Bill Viola question the phenomena of sense of perception as a way to self-knowledge with an accent on fundamental human themes as birth, death or aspects of consciousness. Since the early 70’s, he has created over 150 various artworks, from videotapes, video installations, sound environments, electronic music performances to recordings intended for television productions, establishing the video as an equal and widely used form of contemporary art. With an inner expression of subjective thoughts and collective memories, his art speaks to a wide audience which is enabled to experience the work in a personal way. Viola was born in 1951 and grew up in Queens and Westbury, New York. He studied in the Experimental Studios of the College of Visual and Performing Arts and graduated with a Bachelor of Fine Arts at Syracuse University. His first job was at Everson Museum of Art where he worked as a video technician, but soon the artist moved to the position of technical director at Art/tapes/22 in Florence, one of the first video art studios in Europe, where he met video artists Nam June Paik, Bruce Nauman and Vito Acconci. His television premiere occurred in 1976, during his engagement at the WNET Channel 13 Television Laboratory in New York, when he created a series of works. Accepting the invitation to show his videotapes in Melbournian La Trobe University in 1977, Viola determined his destiny by meeting cultural arts director Kira Perov who became his wife and lifelong collaborator. They lived in Japan for a year, where beside the job of artist-in-residency at Sony Corporation’s Atsugi research laboratories, the couple studied Buddhism with Zen Master Daien Tanaka. After they returned to the United States and settled in the Long Beach, Viola and Perov started to explore medical imaging technologies of the human body, animal consciousness at the San Diego Zoo and rituals of tribes from Fiji island, based on walking on fire. Their next project was about Native American rock and sites which they photographed and taped with specialized video cameras. As a representative of the United States at the 46th Venice Biennale, Viola showed a series of works named Buried Secrets, among which is one of his best-known pieces, The Greeting, his interpretation of Jacopo Pontormo’s The Visitation. The sixteenth-century painting transformed into a mysterious contemporary narrative use the extreme slow motion emphasizes the characters’ gestures and glances, expressing the psychological dynamic of the exchange. In 2002, Viola created his most ambitious project, Going Forth By Day, a five-part projection-based installation in HD video that explores the cycles of human existence – birth, death and rebirth, through the different phases in each video with audio accompaniment. Two years later, his successful collaboration with director Peter Sellars and conductor Esa-Pekka Salonen resulted with the new production of Richard Wagner’s opera Tristan and Isolde, presented in project form by the Los Angeles Philharmonic and premiered as a complete opera at Parisian Opera in 2005. Viola’s distinctive exquisitely detailed high-resolution slow-motion imagery emphasizes effects of water and fire and subjects’ interaction with them. A fan of graininess of the old analog video, Viola used everything from 35mm film cameras to analog black-and-white CCTV surveillance cameras which are his favorite. Mostly dealing with the ideas of human consciousness and experience, Viola always draws inspiration from his interest in mystical traditions, as Buddhist, Christian, and Islamic spiritualism conveyed through the aesthetic of western medieval and Renaissance devotional art. Constantly followed by dualism and the idea that someone can’t understand something until he perceives its opposite, he is focused on the themes of life and death, light and dark, loud and quiet. Divided into three categories, Viola’s work is conceptual, visual or a unique combination of the two. His ultra-slow motion video involves the viewer, encouraging him to dive into the display and its deepest meaning, making the work accessible and close, which is unusual characteristic in a context of contemporary art. The big themes of human life also affect his relationship with the audience, critics, and collectors. Since his beginnings, music has always been an important part of Viola’s creation. From 1973-1980 he collaborated with avant-garde composer David Tudor as a member of his Rainforest ensemble, later called Composers Inside Electronics. The artist has also signed the videos from compositions including 20th-century composer Edgard Varèse’ Déserts in 1994 with the Ensemble Modern, and, in 2000, a three-song video for the rock group Nine Inch Nails’ world tour. In the history of video art, he stands out for his brilliant employment and integration of sound. Through his cooperation with Tudor, he comprehended sound as “a material thing, a physical entity” that defines space as much as light does. His medium represents the so-called perceptual field in which both sound and visual support the understanding of space and time. He uses low frequencies for the same manipulations as the images, in an attempt to bring into consciousness things that are beyond the level of awareness. Music always follows the visual display and his method of binaural recording simultaneous with photography, opposite to the Hollywood standards of mixing soundtracks down to two stereo channels, provides realistic depth and resonance. Among his recent works, installation Ocean Without a Shore from 2008, represents his comeback to the Venice Biennale (52nd). Exploring the theme of life and death, the video shows people standing in the black foreground, producing gallons of water from themselves as if they were waterfalls. In 2014, St Paul’s Cathedral in London housed Viola’s Martyrs (Earth, Air, Fire, Water), an installation consisted of four screens each displaying a single figure overwhelmed by the attack of natural force. Gathered around the theme of martyrdom for beliefs, images of physical suffering reflect the human capacity to bear the pain and even death in order to remain faithful to their principles. 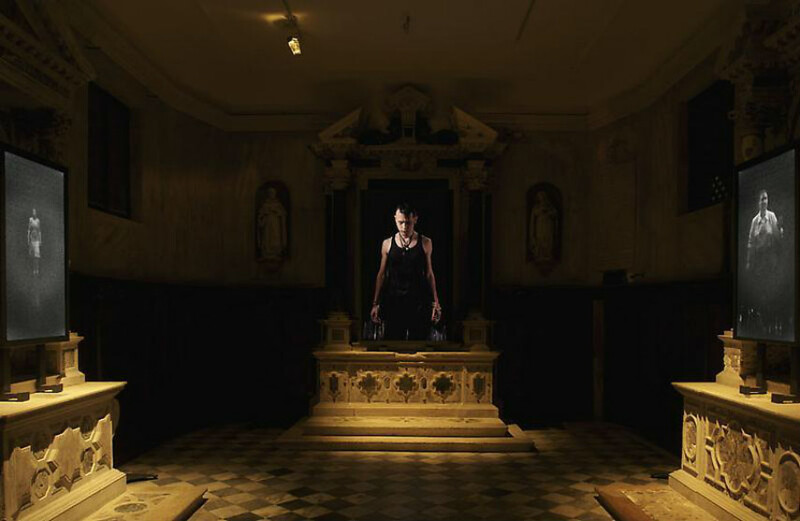 The Martyrs is followed by the second large-scale video installation in the same church, Mary Carries the Body of Jesus, and they make the first moving-image artworks to be installed in a cathedral in Britain on a long term basis. “The two themes of Mary and Martyrs symbolize some of the profound mysteries of human existence. One is concerned with birth and the other death; one with comfort and creation, the other with suffering and sacrifice. If I am successful, the final pieces will function both as aesthetic objects of contemporary art and as practical objects of traditional contemplation and devotion.” – was the artist’s words. Since the beginning of his career, Viola’s video artworks have been seen all over the world. Among the most prominent exhibitions is Bill Viola: Installations and Videotapes, Museum of Modern Art, New York, 1987; Bill Viola: Unseen Images, seven installations toured six venues in Europe, 1992-1994, organized by the Kunsthalle Düsseldorf and Kira Perov. Viola represented the United States at the 46th Venice Biennale in 1995 with Buried Secrets, a series of five new installation works. In 1997 the Whitney Museum of American Art organized his great retrospection, Bill Viola: A 25-Year Survey that included over 35 installations and videotapes and traveled for two years to six museums in the United States and Europe. In 2002 Viola completed his most ambitious project, Going Forth By Day, a five-part projected digital “fresco” cycle, his first work in High-Definition video, commissioned by the Deutsche Guggenheim Berlin and the Guggenheim Museum, New York. Bill Viola: The Passions, a new series inspired by late medieval and early Renaissance art, was exhibited at the J. Paul Getty Museum, Los Angeles in 2003 then traveled to the National Gallery, London, the Fondación “La Caixa” in Madrid and the National Gallery of Australia, Canberra. One of the largest exhibitions of Viola’s installations to date, Bill Viola: Hatsu-Yume (First Dream) (2006-2007), drew over 340,000 visitors to the Mori Art Museum in Tokyo. In 2007 nine installations were shown at the Zahenta National Gallery of Art, Warsaw; and Ocean Without a shore was created for the 15th century Church of San Gallo during the Venice Biennale. In 2008 Bill Viola: Visioni interiori, a survey exhibition organized by Kira Perov, was presented in Rome at the Palazzo delle Esposizioni. In 2014, twenty works were shown at the Grand Palais, Paris, in his largest survey exhibition to date, and a few months later, part one of the St Paul’s commission was installed in the London cathedral, Martyrs (Earth, Air, Fire, Water). 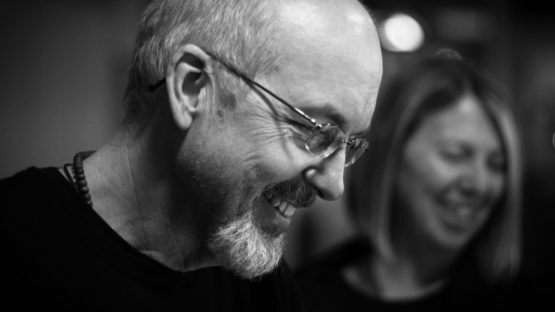 Bill Viola is a recipient of numerous awards and recognitions for his extraordinary achievement in the field of Video and Media Art. Bill Viola lives and works in Long Beach, California.